Since 2004, Samford University’s Orlean Beeson School of Education has partnered with a Birmingham-area elementary school for the annual John and Frances Carter Young Authors Conference. 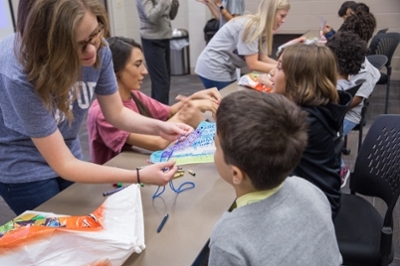 This year, more than 100 third-grade students from Trace Crossings Elementary School in suburban Hoover visited Samford University to participate in the annual event. The event serves as an opportunity for members of the Early Childhood, Special Education, Elementary, Elementary Collaborative (ESEC) junior class to practice planning and implementing an educational field trip for students. ESEC third-year candidates are placed at Trace Crossings for a year-long field placement, and Young Authors Conference affords them the opportunity to practice choosing curriculum, writing lesson plans and activities, creating a field trip schedule and other aspects of event planning. “This event provides an opportunity for our candidates to be immersed in the elementary school culture,” said Michele Haralson, director of the Samford’s Curriculum Materials and Technology Center. Every year, the event focuses on diversity through children’s literature. This year, students were split into groups and rotated across four stations. Each station held a discussion and activity themed to a different children’s book. ESEC candidates discussed the book or did a Readers Theatre to get the Trace Crossings students engaged. Then they followed up with an activity that incorporated themes from the book. In the room themed Maniac Magee, a book that focuses on a young boy orphaned at a young age who runs away, students made shoes and wrote ways to be a friend. In the room themed for the book Because of Winn-Dixie, students made a Mistake Tree just like the character Gloria’s tree. Other rooms were themed after The One and Only Ivan, a book that celebrates the transformative power of unexpected friendships, and Inside Out and Back Again, a story inspired by the author’s childhood experience as a refugee. The day concluded with a writing workshop hosted by children’s author, speaker and artist Jo S. Kittinger. The Birmingham native’s projects can be found in numerous books, newspapers and magazines. Kittinger says she loves to visit schools and conferences like Samford’s Young Authors Conference to share her passion for reading and writing with students and hopefully inspire future authors. The conference honors John and Frances Carter, who both taught in Orlean Beeson School of Education. Over the years, the Carters have continued to support the school’s programs through scholarships and by sponsoring the conference. Frances Carter attended this year’s event with her daughter, Nell Branum. The pair moved from room to room, visiting and speaking with young students and student teachers.